Google Scholar offers a very popular way to create a profile that showcases your papers and the citations they have received. This can be linked to your other websites. More importantly, anyone who finds one of your papers on google scholar will be able to click on your name to go to your site and see all your papers. Pretty much anyone who publishes papers should get a google scholar profile. All you need is to have a university email address. Setting up an account should only take a few minutes. 1) a googlemail account. If you do not have one, simply go to gmail.com and set one up, you simply need to pick a user name and password. 3) The first page will ask for you university affiliation, and your university email, so that google scholar can confirm you are really you. Add any relevant keywords to make your account easier to search for. You should also add a link to your university homepage. You can also add a photo at this point. 4) Add your publications. Simply run a search on google scholar for your name, and add your publications that come up. If any old ones are not listed, you can add them by hand by clicking on “+ Add” in the gray toolbar above your article list. 5) Confirm that google should automatically add new articles as they are published. But if you have a very common name, google might add articles that are not by you. In this case, it is better not to automatically add them, and instead google will email you for a confirmation each time an article appears that it thinks is by you. 6) Add co-authors. Google will automatically locate any co-authors of your papers, and place them in a list to the right of the page. Simply click on the plus sign next to each name to add them as an official co-author. Congratulations! You have a google scholar profile! Upkeep: the profile should update itself when you are cited, or when new publications arise. But it is worth checking it every now and then in case it has missed a paper, or given you a publication that is not really yours. 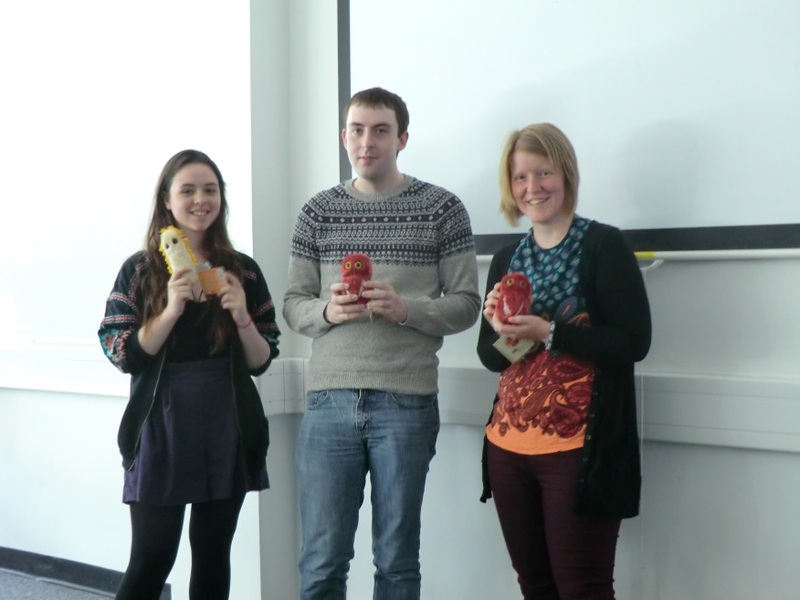 Guest post by Alex Lowe, Frederick Bennett and Michelle Durrant. 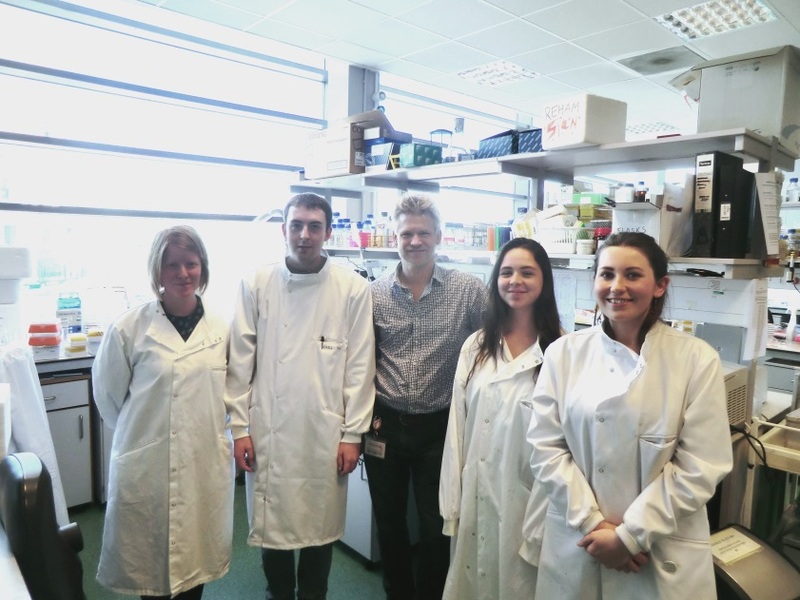 From the 6th– 10th July, A-level students Alex, Frederick and Michelle spent a week with Prof Jay Hinton and PhD student Siân Owen to experience what life is like in a research institute. They did a microbiological survey of the Institute’s kitchen areas; results below! I had a fantastic week. I gained huge amounts of information; and was able to meet staff from a number of different departments. I saw what research on plants involves, toured the aquariums in the basement, and met Linford: a (non-venomous) California kingsnake, who had previously escaped for three months. The machinery in the genomics and proteomics labs is as impressive as it is expensive. The entire week surpassed all of my expectations. I had a lot of fun, and the knowledge, skills and confidence gained during the week will be incredibly valuable during my degree. Initially I was feeling slightly nervous about starting as an intern and found the idea of working in a laboratory quite daunting. However, after meeting the other interns and the students and staff who worked at the university, I felt a lot more relaxed and at ease. Looking back, my preconceptions of what working in a laboratory would be like were quite different to how they truly were. 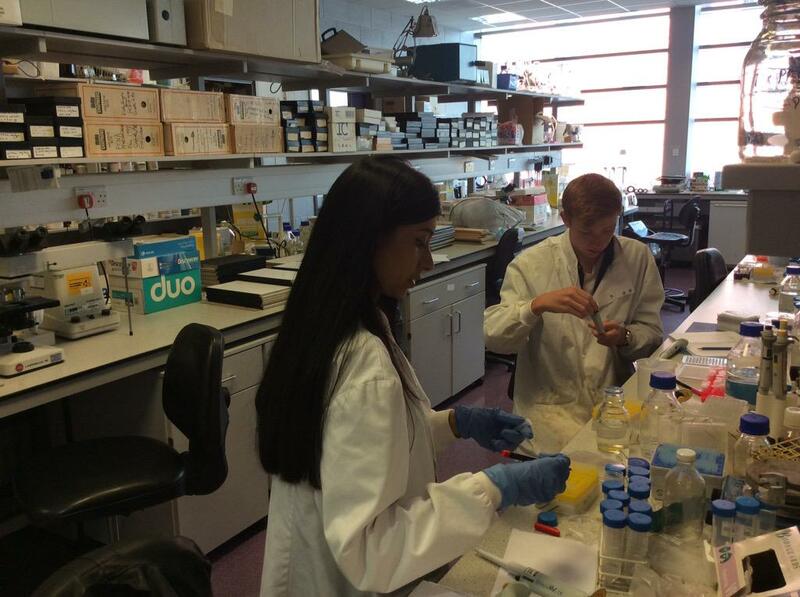 It was a very relaxed and open environment, and meeting some of the other researchers and being able to learn what they were doing was very interesting. When we were not in the lab (or swabbing the institute’s kitchens) we were on tours throughout the institute to see the amazing facilities and learn more about what other labs were looking at in the university. This showed us all the number of different paths in science. I suggest any aspiring scientist should aim to find experience because it shows you a real life situation, and shows you what an exciting field science is to work in. The week has really motivated me to work harder and keep an open and creative mind. Being in the lab gave me a unique experience and understanding of how scientists work and let me understand lab protocols, which will give me an undeniable advantage in the future. Thanks to the members of staff who gave up their time to give tours and talk to the students. The results of the microbial abundance survey of the kitchen areas of IIB. 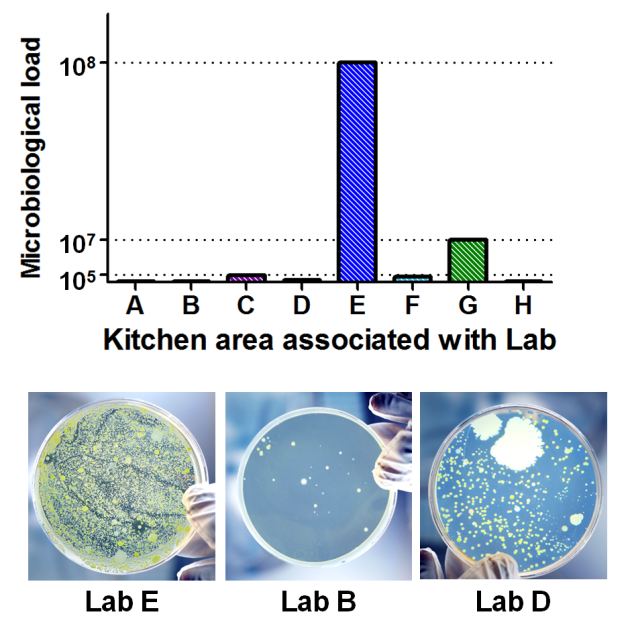 The microbiological survey of the Institute’s kitchen areas found the highest abundance of bacteria in the kitchen area associated with lab E, closely followed by lab G. Labs C, D and F showed a medium abundance, with A, B and H having the lowest. Altogether, a huge diversity of microbial life was found! 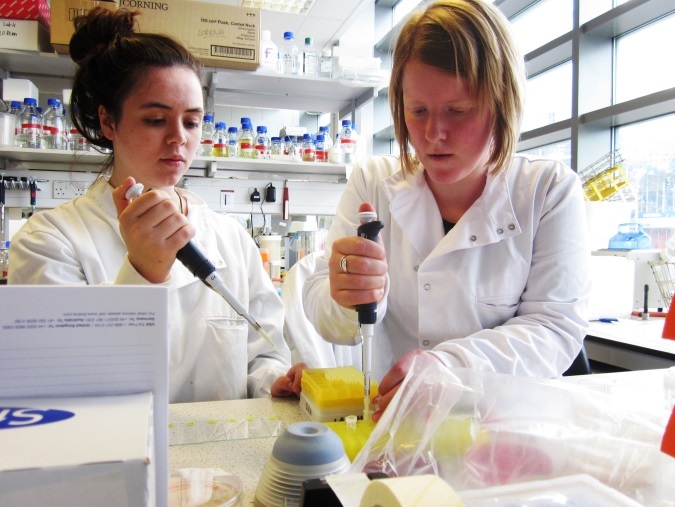 Nuffield Research Placements (previously Nuffield Science Bursaries) provide over 1,000 students each year with the opportunity to work alongside professional scientists, technologists, engineers and mathematicians. Raphael Levy’s group has hosted students last summer and this summer.